A one-woman, one-pooch play follows an astronaut and her faithful companion as they adventure through the galaxies. She wanted to do an entire show with her French bulldog, Jezebel. All three come together in Hillyard's new play, Jezebel, at the Still Point, which runs until Oct. 21 at the Roxy on Gateway. 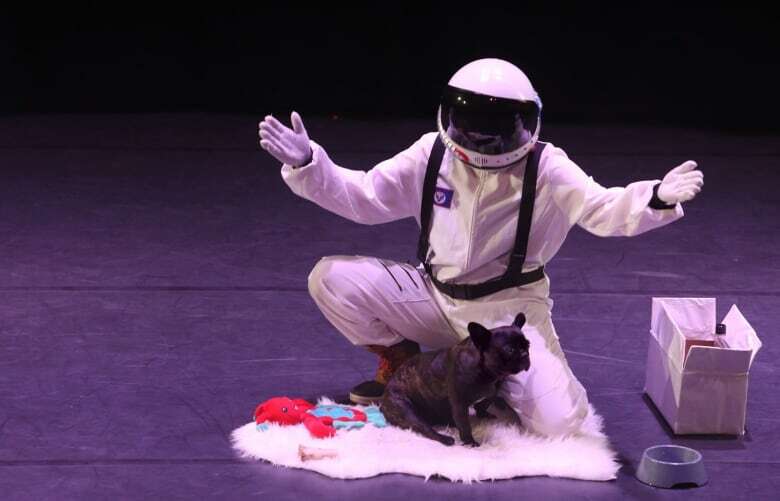 The one-woman, one-pooch play follows an astronaut and her faithful companion as they adventure through the galaxies. At the plays heart is the love between dog and owner. The astronaut and her pup are attempting to crack the code on time travel so that Jezebel never has to die. It's a fantastical version of art imitating life. "I mean, I'm a bit obsessed with Jezebel, and with animals in general, since I adopted her about four years ago," says Hillyard. "[Death is] an impending doom with any kind of pet." Working with an animal means that each and every show is different, depending on Jezebel's level of cooperation. While Jezebel is sweet, calm and chill, making her suitable for the stage, she isn't exactly consistent. "I have a general sense of what she's going to do, but you know, she always surprises me with something everyday," said Hillyard. "The show is fully scripted and, me as an actor and performer, I want to make sure that I'm hitting all of my cues and I don't mess up any of the words or any of the choreography. "But sometimes she'll mess it up for me and I'll have to go off-script and improvise around her and navigate through the audience and grab her from under somebody's feet or whatever." The idea has been kicking around Hillyard's brain for a couple of years. "I always had that list in my back pocket. But I thought, well, it would be great to do a show with Jezebel, but people might think it's ridiculous. So I'll keep it on the back burner." It was a two-week mentorship program with Denise Clarke of One Yellow Rabbit Performance Theatre in Calgary that finally empowered Hillyard to go for it. "We were talking about things we wanted to explore. "But as we were going through the first week and talking about things that I was passionate about and that were important to me ... she was like, 'You know Ainsley, this is all really great but I think that when you come back on Monday, you should bring Jezebel with you because it just seems like everything you're talking about is starting to revolve around her,'" recalls Hillyard. "So I was like, 'Alright. If I have Denise Clarke's blessing to make a show about my dog, I feel like I'm good so I'm gonna go for it.' "
Despite the challenges, it's a blast working with her best pal. And Jezebel is a natural. "I've built the show around her, so she can steal the show from me. And the whole bit is that she's supposed to steal the show from me at any possible turn."